Gugold.com is a online casino game site launched in April 2006. we accept Perfect Money E-Currency. No Sign Up,No Download.Your winning will be paid automatically after each game finish. 1. Choose HEAD or TAIL! 2. Place your BET and WIN 210% if your bet is right ! ♠ HELLO 2019 ! Have any question please Contact Us. ≡ Promote our Head-Tail Perfect Money and earn 10% of every bet ! Uxxxxxxx is your Perfect Money account number .No account or approval is needed.Ref bonus is instant paid out. You will get your referral commission every bet instantly. 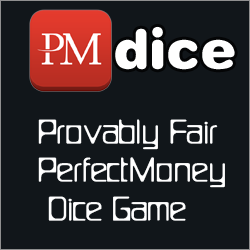 Provably Fair PM Dice Casino! Disclaimer: This is only a game, DO NOT bet what you CAN NOT afford to lose.